Argentine President Mauricio Macri and Chinese Communist Party leader Xi Jinping spent much of Sunday, the day after the G-20 summit in Buenos Aires together, signing billion-dollar trade deals and exchanging gifts. 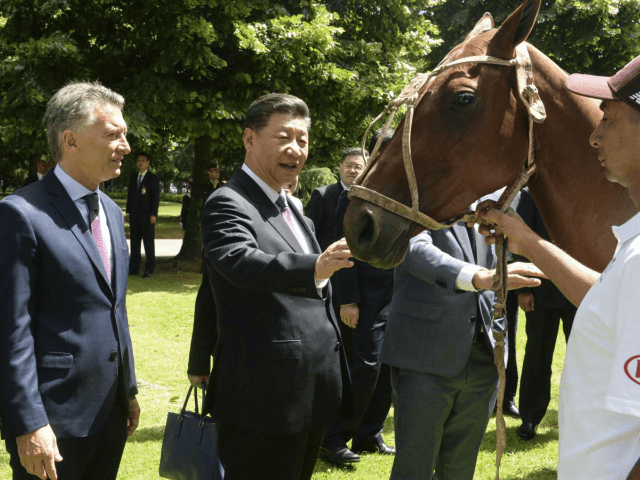 Xi left Argentina the owner of several extravagant gifts including a purebred horse from the Argentine Polo Association (AAP) and the nation’s highest honor, the Order of the Liberator General San Martin. Macri secured up to $3.5 billion in investments from China in energy and infrastructure projects, part of Xi’s sprawling Belt and Road Initiative (BRI), a plan to ensure that China has full control of the world’s most important ports, roads, and railways for international trade. The Polo Association, Argentine newspaper La Nacion explained, gifted Xi one of their prime purebred horses in appreciation for China agreeing to begin importing horses from the country. Argentina is home to breeders of 25 different horse breeds and generated $30 million in equine exports in 2017, according to the newspaper. Argentine media did reveal details of the trade agreements in question. The two countries signed 30 agreements including a currency swap worth $8.7 billion, agreements for China to import Argentine cherries, beef, and polo horses. In exchange, China would agree to invest heavily in infrastructure and energy. “The more China develops, the better things go for China, the better things will go for Argentina,” Macri reportedly said. The infrastructure investments, according to Argentina media, are prodigious and will ensure China’s presence in Latin America for decades to come. Among the projects on deck are the Caucharí Solar Park, attracting $8.6 billion in investment, and a variety of “public-private partnership” projects worth up to $1.1 billion. China will also be involved in upgrading Argentina’s Belgrano Cargas Freight Railway, a project China’s Global Times newspaper felt compelled to defend preemptively from accusations of attempting to trap Argentina in debt. Argentina has become a pivotal point of investment in Latin America this decade following the slow collapse of the Latin American left, which greatly indebted many nations to China and strove to sever ties with the United States. The few leftist nations remaining have either reached such a level of economic decay, such as Venezuela, that the Chinese do not want to invest there anymore, or have begun to cut back on Chinese investment to prevent another Venezuela on the continent, such as Ecuador. Latin America’s largest economy, Brazil, has arguably swung the furtherest right, electing conservative President-elect Jair Bolsonaro. As a presidential candidate, Bolsonaro expressed concern with the nation’s outrageous debt levels under previous socialist governments, vowing to particularly reduce the presence of China in the country’s economy and sparking outrage in Beijing.